• Sponsor an informational time at your coffee hour to share what you’ve learned. • Consider a special offering one Sunday. You can find where to send any donations in Bishop Dawani’s appeal. • Tell your family and friends. 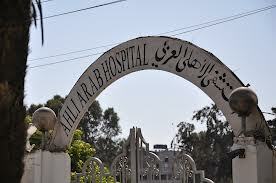 O God of wholeness and healing, we lift up the staff and patients of the Ahli Arab Hospital in Gaza. Strengthen and guide the Management and all the staff as they treat the poor and injured. Bless the patients who receive care with your healing touch. Give us a renewed awareness of the blessing of health and grant us the courage to support the caregivers in their work. Give wisdom and guidance to the leaders of these lands to strive for peace and reconciliation. All this we ask, in the Name of your Son, our Lord Jesus. Amen.